Success, the forcing cone is now lengthened. The forcing cone is the tapered area just forward of the chamber that allows the shot an area in which to transition into the bore. As the shot then travels through the barrel, it passes through the choke at the end of the barrel. A lengthened forcing cone provides a smoother transition for the shot leaving the chamber and results in less perceived recoil for the shooter. Since the transition is at a gentler angle, there is also less deformation of the shot pellets. An outstanding cutaway picture of a lengthened forcing cone can be found here. Before attempting to use a reamer on a barrel, make sure the barrel isn’t chrome lined. An easy way to tell is to apply some cold blue to the bore and see if it takes. Additionally, make sure the forcing cone reamer will not remove too much material, leaving the barrel wall dangerously thin. Consult a gunsmith and have your work checked to make sure it is safe. The extended forcing cone reamer and a tap handle. Once the forcing cone is cut, the surfaces need to be honed. We have had excellent success with flex hones from Brownells. The flex hones have a series of abrasive balls which create a slurry in a special oil, polishing the interior surfaces of the bore when driven with an electric drill. 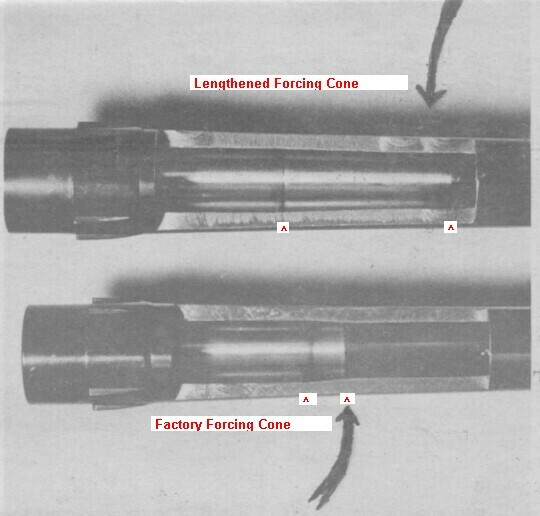 Flex Hones, (Left to right) Medium grit bore, fine bore, fine chamber, fine forcing cone. For this project we will use medium (not shown) and fine forcing cone hones as well as a fine chamber hone. Once the honing process is complete, we clean the bore and inspect our work.